The 130X employs a particular FBL head design, that system can perform better if special semi-rigid dampeners are used. Our dampeners will increase the response and the fly precision in your 130X with standard plastic head or any brand head upgrades parts. Lynx 130X dampeners are composed by two pieces - one O-ring to maintain the necessary preload (to remove side by side play) and one bushing in techno-polymer auto-lube to assure maximum load and friction resistance. These dampeners give your 130X an incredibly precise feel in the air. The difference is visible, particularly in fast forward flight and with quick pitch changes. Our tests show that 130X Lynx dampeners are advised when high head speed is requested (100% throttle curve in STD. heli configuration). - Increased head rigidity give precise and crispy fly feeling with standard plastic head or with any brand head upgrades parts. - Incredible spam life resistance. - Direct replacement for your 130X heli. 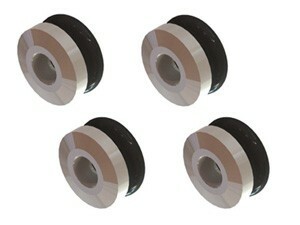 - Bushing Material: Techno-Polymer base POM. Before install Lynx 130X dampeners disassembly the main grip and remove STD dampeners and STD metal shims. Don't lubricate the O-Ring or any other parts. Install the O-Ring and the Bushing respecting the order shown in the extra picture below. Bushing have special shape design , are symmetrically than you don't need care the direction are installed, just be sure about O-Ring faced to main hub and Bushing faced to main grip. Once heli assemble, test and in case of cyclic shacking adjust cyclic gain reducing Aileron and Elevator gain.